Residential Applications Protect Your Employees, Subcontractors and Assets. The Safety Boot Guardrail System is utilized on a residential stairway with open balconies and open entry way. A 90 degree angled Guardrail System is used to protect a curved open balcony. This utilizes the toe board flanges on each Safety Boot and meets the OH&S requirement of providing toe board protection on all open balconies. Open balconies can be fully protected from falls and meet all OH&S guardrail requirements. 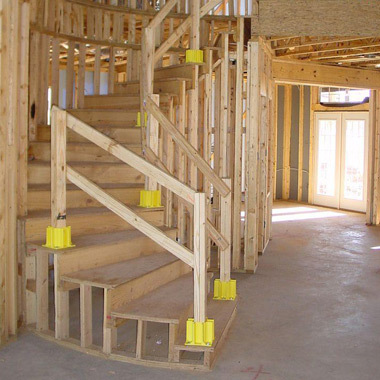 The Safety Boot Guardrail System does not tie off to the framework and leaves ample room for the drywall contractor. The Safety Boot Guardrail System will remain in place during the entire construction.